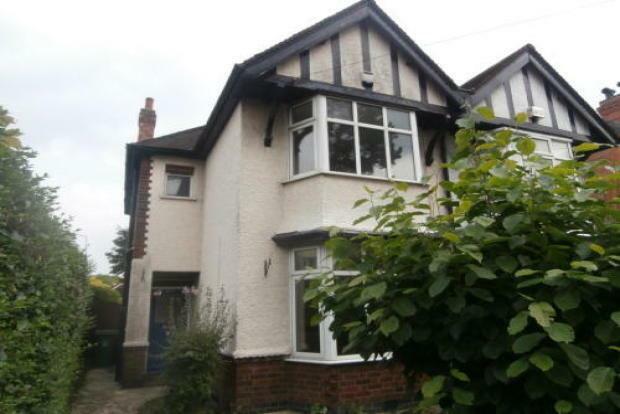 3 Bedroom Semi Detached House To Rent in Loughborough for £695 per Calendar Month. This recently refurbished 3 bed semi detached family home in this popular area of Loughborough. Frank Innes are pleased to offer this good quality property close to the town centre. The accommodation to the ground floor includes a porch leading to a small entrance hall with storage cupboard and stairs. The large breakfast kitchen to the rear has a feature fireplace with wood burning stove. There is French doors to the rear garden plus the kitchen comes with a cooker. There is also a utility off the kitchen. To the front of the property is the lounge with fireplace and this has been newly decorated and has a new carpet. To the first floor are two double bedrooms (both with wardrobes) plus a single bedroom. The main family bathroom has a shower over the bath. To the front of the property is a small mature garden (garage not included). The rear garden has a large patio area, lawned garden plus shrubs, hedging and greenhouse.